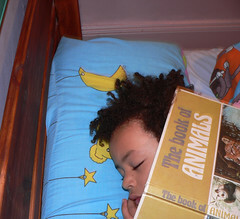 You are here: Home / Parenting / Learning to read while sleeping? Yeah, this might not work…but good try Jen. Oh you don’t know how envious this shot makes me feel – my dd will never fall asleep without really intentionally preparing to do and and doing so – drove me wild when she was a toddler!! That’s a very cute photo!